A cool new quiz from Arcade Aid will put your classic game skills to the test as you track down 56 videogames cleverly hidden in the streets of an 8-bit city. Here's the deal: Hidden across a bright, 8-bit-style cityscape are 56 cleverly-hidden videogame titles, ranging from old-time classics and arcade stand-ups to the biggest releases of the modern era. But it's not quite as easy as just pointing and clicking, because every title is represented by an occasionally bizarre pictograph and you're going to have to figure out what they are. Some are quite easy. A picture of a hamburger with a clock on the top bun, for instance, is Burger Time, while the billboard of the big golden axe is, big surprise, Golden Axe, but others are far more obscure - the robot werewolf with the big club has me stumped - and a few are quite small and tricky to pick out. 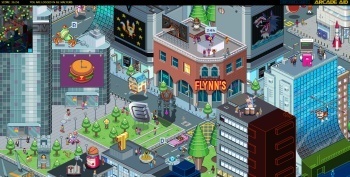 There are also numerous Tron references, like Flynn's Arcade, Flynn Lives posters, the Encom building and of course the fact that the entire city is in the process of being de-rezzed, but even if you couldn't care less about Tron the quiz is a lot of fun and very challenging in its own right. Most of the games are easy enough to figure out with a little bit of thought (and knowledge of game titles) but even so, I've only managed to figure out 35 of 56 so far. Obviously I need some help to wrap this sucker up, so head over to arcadeaid.com and see what you can do. Feel free to post your answers, just do everyone a favor and use spoiler tags - I'm not quite ready to give up on figuring out that crazy-looking cow thing just yet.